Every now and then I get a little craving for some DIY. Usually it is a result of me spending way too many hours sitting in front of Selling Houses Australia or Better Homes and Gardens. However, sometimes it just comes out of the blue for absolutely no reason at all. This was one of those occasions, the completely out of the blue urge. 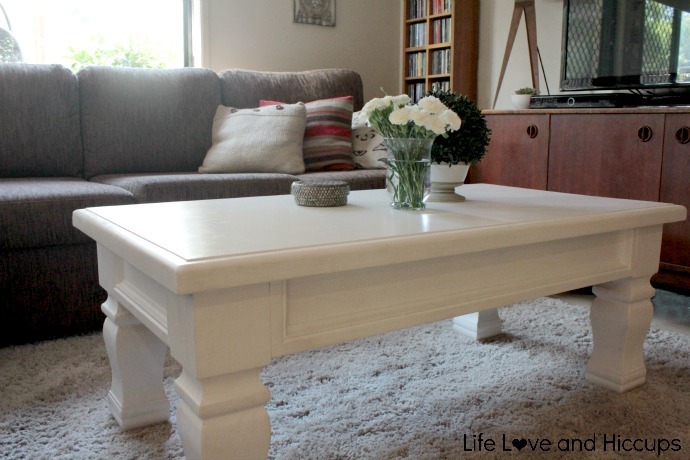 Sitting in our family room watching TV one night I suddenly decided I wanted a new coffee table. Something bigger than the one we already had and something substantially chunky. I do love a bit of chunk with my furniture. 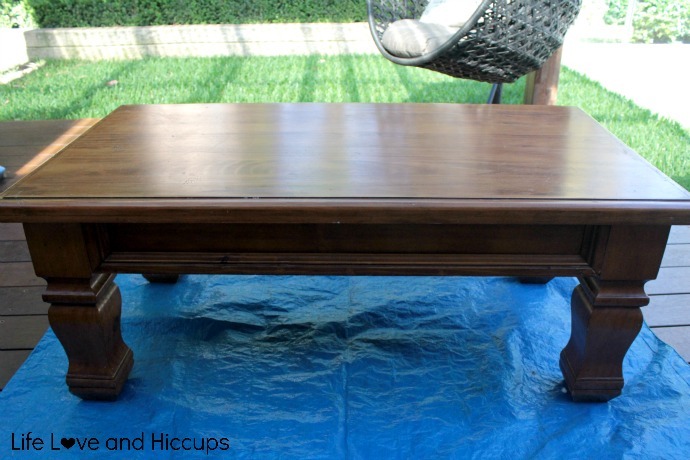 Next thing you know I was on one of those buy, swap and sell sites that are popping up everywhere and I was negotiating with some complete stranger for a solid wooden coffee table. They wanted $100 for it, I wanted to pay $50. Eventually we settled on $70 and the coffee table was mine. When the hubby arrived home the next day after picking it up, he wasn't so enthusiastic with my purchase. "Why would you pick something so big and dark" he enquired with that I have no vision look that husbands do so well. "Trust me!" came my stock standard response. You see I had a little something special planned for this coffee table. 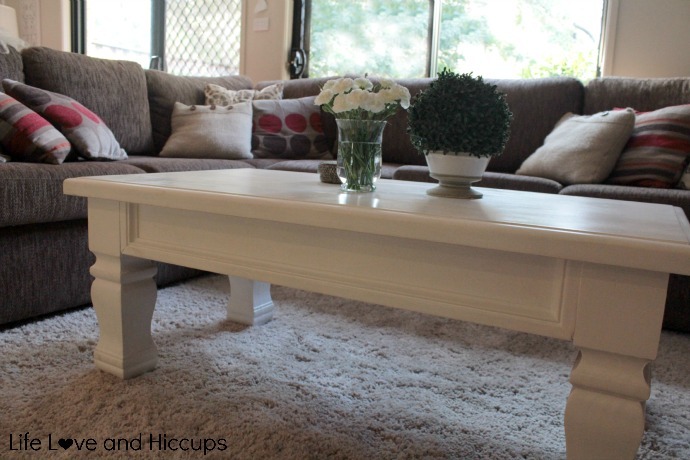 This table and I were going to spend some quality time getting to know each other and I had the perfect day all organised for us, with a tin of primer and white paint and the compulsory jar of Gummi bears to keep us company. Wanna see some random photos my husband took of me as I prepared this little baby? 50 zillion coasts of paint later (only a slight exaggeration) and we were done. She took up her position in our family room. She's real purretty don't you think? The only problem I have now is keeping off grubby little feet that are itching to rest on her. A fly swat works well for that, you know just in case you were wondering what marvelously skillful and effective parenting technique I use for that one. 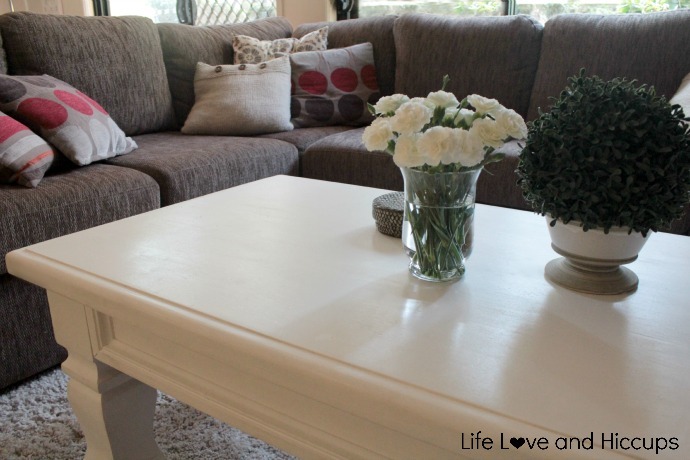 On a serious note, well not too serious as coffee tale makeovers are hardly life changing matters are they, but if you are planning to paint some furniture yourself - do yourself a favour and take the time to prepare the furniture properly. Look I get it - who has time for a lot of fussing around? 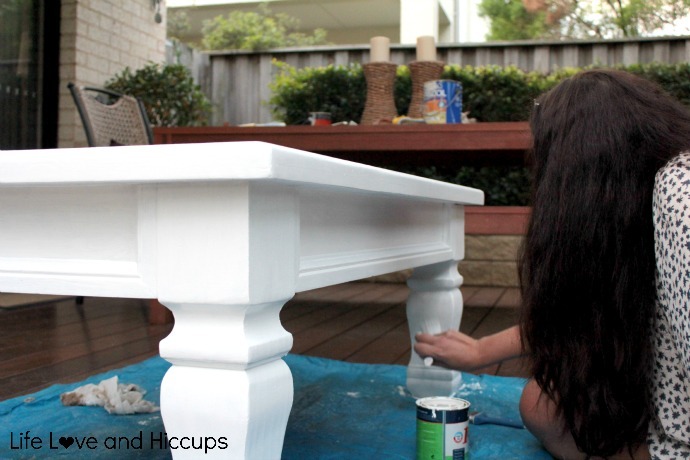 I am typically the queen of the slap and dash when it comes to furniture painting. But on far too many occasions I have had to come back at a later date and waste more time touching up because I impatiently rushed in and it ended up chipping or peeling. I don't know about you, but I just can't be assed touching up. So give it a good sand and wipe down before you even think about beginning to paint. And make sure you use a good quality primer and paint brush. The finish you will get is so worth the little extra effort. She's really is so purretty and a total bargain at $70. 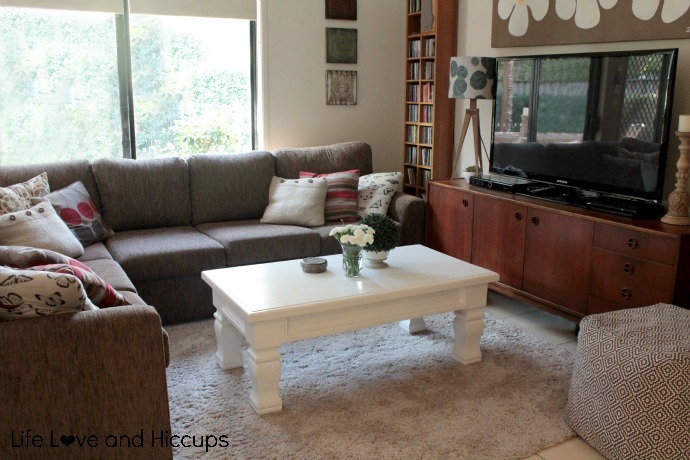 Have you got any furniture lying around that's just screaming for a makeover? 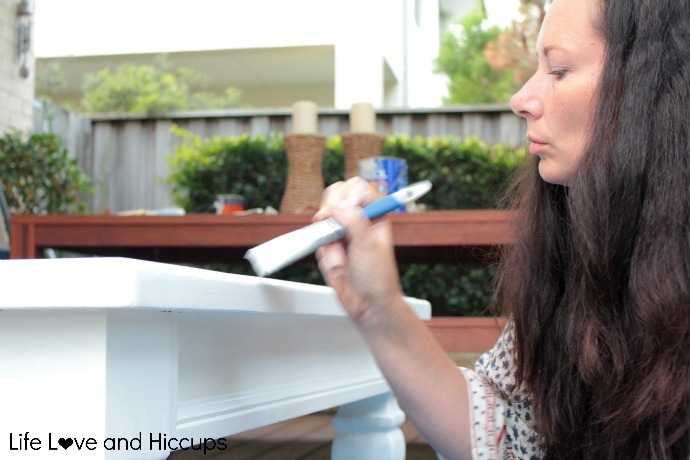 I am linking up over at Domesblissity for Thriving on Thursdays.